900MHz: 900MHz is part of the UHF radio spectrum and allows for communication in a very local setting. This issue with radio waves is that they can be subject to some interference, so it may be beneficial to check for similar and existing frequencies in potential environments, but a majority of the time it won’t be an issue. The radio-enabled wireless connection can have more range than 2.4 GHz Wi-Fi and has the ability to travel through walls and objects with much more success due to its low frequency. This wireless option is the most applicable if efficient and quick communication is needed. 900MHz can typically communicate with desired devices in under ten seconds. Wi-Fi: Wi-Fi is a very practical solution if instantaneous communication is not a concern. Most devices that operate with Wi-Fi are able to operate while offline and can be updated periodically via the internet. Wi-Fi typically has a greater range than BLE, but consumes a good amount of power while operating. Setting up a Wi-Fi connection is also more tedious than it may be with BLE or 900MHz. If security is a concern, Wi-Fi has a more complex encryption than the other options. Wi-Fi removes the locational restraints and allows for greater command over a network of interconnected devices. BLE: BLE connection is very useful when communication is occurring between multiple devices that are near each other. The speed and data transfer rates of BLE are not great, making it best suited for low-bandwidth use. BLE devices consume low amounts of energy; this can be beneficial for long-term use as operational costs will be very low. This connection assimilates very well with consumer applications of the Internet of Things. 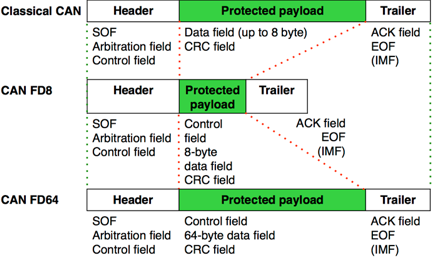 Before any wireless connection is used in a device, there are several factors that need to be reviewed in order to maximize functionality. Manufacturers need to consider the context in which the wireless communication will be occurring. For instance, elements such as speed, signal range, reliability and accessibility, power consumption, security, and user-friendliness are some of the critical things to consider when analyzing applicability of a wireless connection. As more manufacturers enable their products for the IoT, consumers will be introduced to many different cloud applications due to lack of cooperation between difference devices and companies. This is where the emerging IoT standards can help. Device manufacturers who support these standards will be able to ensure their products will be able to work and communicate with other manufacturers’ products that support the same protocols. This makes operating many IoT-enabled devices together much more simple and convenient. This also opens up new business opportunities by allowing for new features that the original manufacturers never dreamed of. For example, interoperability means that one day it might be possible for a consumer to simply say, “good night, house” to their app, and the app will programmatically turn-off all of the main house lights, TV’s and appliances and turn on the outside lighting, set the alarm clock for the morning and set the coffee pot to start brewing when the sun rises. In this example, each device could be from a different manufacturer, but since they all support the same standard, the application knows how to talk to them all and create new service offerings. Some of the emerging interoperability standards include: Thread (supported by the likes of Google/Nest, Samsung and more), HomeKit (supported by Apple), AllJoyn (supported by Microsoft and Sony, part of the AllSeen Alliance), IETF (an internet standards body) and ETSI (a European-based standards organization – primarily in Telecom). The standards landscape is changing rapidly and manufacturers need to adapt their products to work with these standards as they are consolidated and settled in the future. Building a secure IoT-enabled device comes at a cost. As the IoT continues to grow, there is an increasing focus on its security and how safe the claims of end-to-end solutions really are. While security threats in the news have scared away some manufacturers and consumers from entering the IoT space, others view it as an opportunity for added value to their products. Implementing high-cost security into every product a company has is ideal, however not very economical. Manufacturers must find proper security for each of their IoT solutions while keeping costs down for them and their end-user. This process must start at the time of a product's conception. Proper due-diligence is required from each manufacturer to find a way to secure their devices, protect their consumer and ultimately, the rest of the IoT world as well. Power considerations need to be made when connecting a product to the IoT. Products already using a wall outlet will not have an issue. Manufacturers of products not using a wall outlet will have to consider how their power source will affect their product’s design. IoT devices running on batteries will have to make hardware decisions based on power conservation. There are also a variety of different types of batteries to be taken into consideration: alkaline, lithium (rechargeable) and coin. There are also AA, AAA, coin cell, C, D, 9V, or custom batteries to choose from. 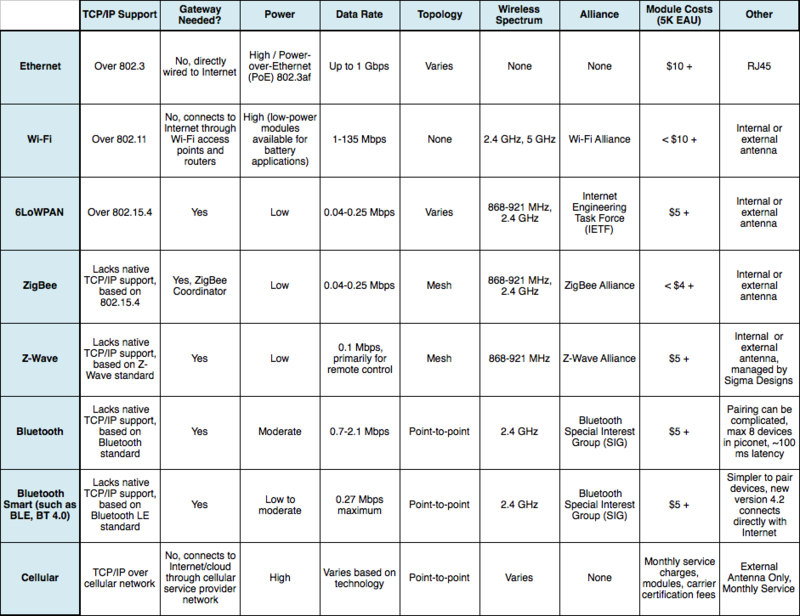 As noted earlier, wireless technologies have different power requirements based on use-cases. Once a manufacturer understands how long and how often a device will be connected and the wireless network is chosen, a properly sized and type of battery can be chosen. Another source of power for Ethernet-based devices is Power-over-Ethernet (PoE). This technology is popular for low-wattage IP phones and security cameras. Recent advancements and new switching technology is pushing the wattage available through PoE to new levels, thus opening up new possibilities for more power-hungry applications and devices. Many manufacturers start testing the IoT waters by modifying their existing product designs to add networking technologies. Because these devices already exist, many early entrants into the IoT world fail to redesign the product to allow for its newly added connectivity. Fortunately, there are a number of compact modules available for networking technologies that will fit in a manufacturer’s existing products. These small modules are different though. Some modules are surface mount, others through-hole or pin-header and some still use a specialized mating connector. Also, how the network connector or antenna connector are integrated into the product vary from module to module. Designers must consider the space they have available on their circuit boards and/or in the product’s enclosures to allow whatever technology selected to be used in existing designs. What solid foreign objects are a part of your operational atmosphere? Will your device need to be dust tight, protected against wires, or not protected at all? If maintenance is not an option due to distance or inaccessibility, then you might need to consider what objects can find their way into your devices enclosure. This is very important in an outdoor application. You want your device to be able to withstand rain. Also what if you need your device to be submerged in water, or need to be able to hose down the device when cleaning an industrial area? These are all conditions that need to be considered when determining which device to go with. Hazardous materials can limit the range of products applicable for use. Without a doubt, you need to have an industrial product for protection against oil, coolant, and other corrosive agents that might be in that operational atmosphere. There are typically two temperature ranges to consider in the specifications of a product: operational temperature and storage temperature. Industrial products tend to have wider ranges for both of these. If you need to store or use a device in an extreme temperature, you would want to use an industrial device. Some applications require a tolerance for impact or fast motion. Some tests that are done on industrial devices include stationary vibration, shock, and vertical free-fall. Some devices are also given an impact rating from 0 to 20.0 Joules. Surge protection ratings specify the protection level electrical devices have from voltage spikes. In certain conditions components need to be able to withstand large spikes in voltage. Industrial devices tend to have a higher range of tolerable AC and DC voltage spikes. In many applications multiple electronics are in the same confined area. Some of which might have motors, or other components that create EMF. It is important, in this case, that your device can tolerate different electromagnetic conditions. Industrial devices have higher electromagnetic resistance than consumer devices. Consumer products are usually powered with a wall plug. Industrial products are often powered in parallel to each other. They share power supplies, rather than having a dedicated power supply for each unit. Some have redundant power inputs that are used with redundant power supplies. Many consumer devices are designed to be set on a desk or other flat surface and do not include any mounting options. Industrial products include mounting options such as DIN Rail Mounting and Panel Mounting. Most industrial products in an industrial application would be functional approximately 3 to 5 times longer than a consumer device in normal IT application.